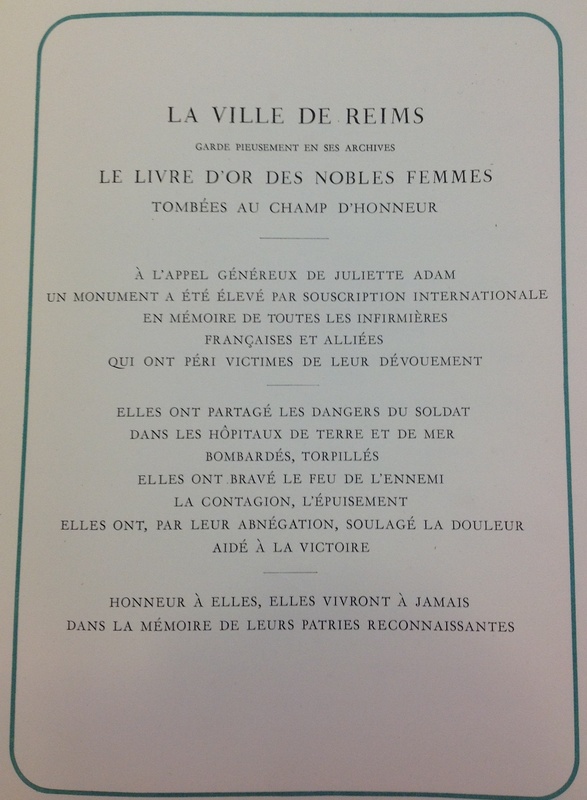 The City of Reims has kept a Roll of Honour (Livre d'Or) detailing the hundreds of French and Allied nurses who came from the four corners of the globe and died on French territory during the First World War. The book is available for inspection at the Reims City Archives - and is very fragile! The staff at the Archive were very gracious to me when I booked my visit and then was able to read the Livre d'Or. The names are listed by country and the Roll of Honour notes that they died, "victims of their devotion." It also states that they shared a "soldier's dangers, in hospitals on land and sea, bombed and torpedoed." It describes that "they confronted enemy fire, sickness and exhaustion." The Roll of Honour touchingly notes how "by their selflessness they relieved suffering and hastened victory." The Roll of Honour ends with the invocation "may their names live forever in the annals of the countries of their birth." The striking memorial itself is located in Place Ceres, on the former main road through Reims. The monument's panels carry the names of the nurses home nations as well as reliefs showing nurses tending the wounded and dying.